When Cancer Council SA (that’s South Australia, not South Africa) started the Ambassador Project as an experiment in revitalizing volunteerism and community fundraising , jumping in to the social media pond was not even on the agenda. Less than two years later, the project has started, Ambassadors are exceeding our expectations, social media strategy is taking shape and we’re proving to ourselves the benefits of becoming a networked non-profit. Cancer Council SA is over 80 years old and is the largest and oldest cancer organisation in South Australia. With over 80 full-time staff, Cancer Council SA is the leading voice in the state when it comes to cancer research, prevention and support. Cancer Council SA is creative and innovative in many ways: innovative research, cutting edge cancer prevention and support programs, and some of the most effective fundraising campaigns in the state. It’s not that we didn’t like or believe in social media … we were just too busy doing other things – good things – to spend much time exploring this largely unproven ‘thing’ called social media. Two years ago I was employed to develop a new program with the goal of building a network of cancer ‘champions’ across the state: passionate people who would take action on cancer in their homes, workplaces, schools, sporting clubs, communities … wherever they are. We wanted to create a more flexible and dynamic volunteer space that we believed would be necessary to engage younger people in the mission of our organization – to beat cancer in SA. It was (and still is) an experiment. When I started we had a tiny budget, a staff of one (about 0.6 actually) and NO MENTION OF SOCIAL MEDIA whatsoever. What we did do was to decide to develop the project through a community engagement process – we gave the initial idea to the community and asked “will you help us create something?”. Over 60 people took part in community meetings, workshops and 1:1 meetings over many months that helped develop and then refine (and then refine again) what would become the Ambassador Project. We learned a lot through this development process. One of the unexpected things we learned was that many of our existing fundraisers and volunteers wanted to be more connected with other volunteers and fundraisers. There were passionate people raising thousands of dollars in the fight against cancer … and they’d never met another Cancer Council SA volunteer. South Australia is a big state and hundreds of kilometers separate one town from the next. We’re never going to regularly connect people face-to-face … but we can connect digitally. The Ambassador Project officially launched last April and the first 8 Ambassadors gathered in a meeting room in our offices in early May. We shared our stories (we cried together) and we talked about the possibility of change, real change in the fight to beat cancer. We finally kicked them out at 7.30 that night. By 11.30pm one of these first Ambassadors had set up a Facebook page and invited the rest of us to join. It was ‘their’ work, not ‘ours’. It came from Ambassadors, not from ‘head office’. Yee haaa. A year on and we’re still taking baby steps. (Like many established organisations with a strong and trusted brand – social media is something I knew we were going to have to go slowly with). The Facebook group is growing slowly but steadily as new Ambassadors join and tell their friends. It isn’t flooded with traffic, but we’ve seen some really meaningful interactions. As I write this, one of those first Ambassadors is back in chemo (again). She lives several hundred kilometers from ‘head office’ but posts every week or two letting her Ambassador ‘friends’ know how her treatment is progressing. We’ve seen community engagement activities started from posted questions and Ambassadors appreciate the news updates on all things cancer. Twitter is on the radar as a way to provide people with more up-to-the-minute news bites and we’re building a blog-centred website to act as a hub for it all. We’re not a model networked nonprofit … yet. But we’ve learned and seen enough to push us over the edge and in to the pool. The first two chapters of the Networked Non-profit book has given us the shared language and vision we needed (thanks guys) and the idea of ‘free agents’ has released us from the fear that this new younger groups of energetic volunteers might not be as loyal as their parents were. We are living proof that learning loops can work and that low-cost, low-risk experiments are a great way for established, traditional non-profits to begin the journey into the deep, dark waters of social media. Matt Sarre has a history in community engagement, community action and people development. 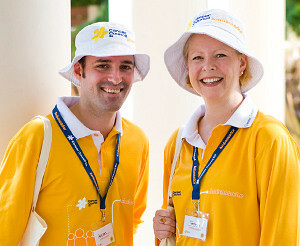 He joined Cancer Council SA two years ago charged with developing a new and younger network community volunteers. Would be great to see you portfio cause it is really interesting. I believe you know major trends and for many of us it would be usefull.